- Specially-designed Spiralized recipes that children love! - Quick, easy Spiralized salad recipes for radiant skin. - Tasty recipe ideas to promote healthy weight loss. - 10 gluten-free recipes using powerful anti-inflammatory ingredients. 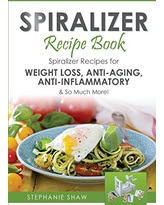 - Heart-healthy recipes with Spiralized vegetables. - Delicious salad recipes with anti-aging properties. Each recipe comes bundled with a full ingredients list, step-by-step instructions, and detailed nutritional information. You’ll also find information about the specific health benefits of each ingredient, including how they can help you fight disease and ward off aging. Whether you’ve just embarked on a new gluten-free diet, or if you’re already a veteran paleo chef, use the recipes in my book to encourage healthier eating in your family. It’s easy to add vegetables to any meal with a Spiralizer, once you know how. I am a registered nurse, working with patients with long term conditions. I have now specialised in Diabetes. It is because I am dealing with conditions that do not respond well with medication like acute conditions and infections do, I have for the past 10 years, been looking at other healing modalities. I apply a mixture of modalities to treat pain, stress such as NLP, hypnotherapy, TFT, quantum touch. I have received training in angel healing and flower therapy which I find very useful tools in my healing repertoire. What I find rewarding is my clients being empowered and having happier and more fruitful lives. The author to this book is really nice.